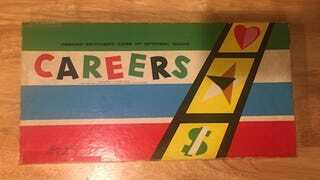 The oldest toy I own is a board game called Careers. It’s set 14 years before Apollo 11 landed on the moon in 1969, yet it includes a moon expedition mission. It’s a curious artifact — a look into a previous generation’s dreams and ambitions, when space exploration was still an unknown intangible. Our dreams, however, don’t always match up with reality. The object of the board game is to ‘succeed at life,’ and the game quantifies that in terms of Dollars (Money), Hearts (Happiness), and Stars (Fame) that you can collect. The way that you acquire these three ingredients is by pursuing a ‘Career Path’ (Farming or Hollywood, for instance — you can even go to College!). But not all of the spaces on the board add to your success. One of the worst spaces to land on in the game is Shopping Spree, where you roll the die to determine how much your wife spent on a shopping spree behind your back. Huh. Later editions, thankfully, get rid of the Shopping Spree altogether. One career is Uranium Prospecting — a nod to the dawn of the Nuclear age, and the ongoing Cold War, which helped propel the space race. But the most ‘high risk, high reward’ Career Path — The Boardwalk/Park Place of the board game — is the Moon Expedition. And since the developers were guessing, blind, at what space and the moon might be like, there were some truly dated squares on the board. Here are best ones, from least to most bizarre. The average person can execute a 20-foot vertical jump on the Moon, assuming that he or she doesn’t have a bulky space suit on to restrict movement. A very, very small mountain perhaps? We can give this one a pass. The Apollo astronauts actually found trace amounts of gold in the soil samples they brought back to earth. It’s not quite what the game designers had in mind — ‘gold dust’ sounds like a greater amount than what actually ended up being there. Still, the designers deserve a little credit — they weren’t completely off the mark, even if there wasn’t enough gold to make anybody rich. It’s a legitimate question: “Why does the moon shine?” But we don’t have to learn the secret; Anaxagoras, who was born in 500 B.C., figured this out already (it’s reflected light from the sun). Surely, there was something better to print on the game board than this. Unless it was a pun on ‘moonshine’ the beverage, in which case I’m just dense, and it still makes no sense. Self-explanatory. It’s not as though there was an option to get caught in a wheat thresher as a Farmer, or die in a hazing ritual in College. This implied that the astronauts, like airplane pilots, would be sitting in the cockpit of their spaceship, flying passengers over to the moon like a commercial airline.. Would they also be nursing cups of soda that are mostly ice? By 1971, Parker Brothers had the benefit of knowing what the moon was actually like, and so they changed some things around (by the 00s, the entire Moon Career Path was replaced by Computer Programmer). Instead of saving a stewardess from the airlock, you could now be the “First Woman In Space.” Instead of your ship exploding, you land on the “Wrong Planet.” It doesn’t make more sense, but it’s an improvement over surviving an explosion. Instead of being the first man to land on the moon, you could now be the first man to land on Mars. And instead of discovering moonshine, you could meet a “Mars Lady.” I guess people always need to dream and hope for something. The Careers board game was passed down to me by my mom, and it’s the only toy she saved from her childhood. She wishes she had saved more of her toys, and so she made me save my own when I was 10. I had outgrown my Teenage Mutant Ninja Turtles action figures, and she helped me wrap each of them up individually, along with the weapons and accessories that came with each one. They were all in my toy chest, in a massive, disorganized mix ‘n’ match, and we spent an entire day getting it all together. She put them all into a massive cardboard box — I think it was actually the box that my Technodrome vehicle came in. It’s been over two decades since then, and that box is still sitting in my parent’s closet, waiting for when my son gets older. So save your toys, ladies and gentlemen. Because that’s how heirlooms and keepsakes are created — one person has the good sense to not throw something out, and then it gets passed down, and appreciated, by a new generation in an entirely different way.